In a fiery rebuttal of Republican and employer attacks on OSHA during the Obama administration, former Assistant Secretary Dr. David Michaels yesterday rejected assertions that OSHA had focused only on confrontation over cooperation, and or that the agency had flouted the law and good safety practice when it came to enforcement, standards and media campaigns. OSHA standards don’t kill jobs. They stop jobs from killing workers. And Michaels described the costs of not issuing standards. There is much talk today of the costs of regulations to employers. Forgotten in this conversation is the cost to workers and their families of not creating these protections. These costs are enormous, and they are paid not just in dollars. They are paid in lives. A lot went down at this hearing and because it touched on a variety of important themes, I will take more than one post to discuss the issues. I fear if I try in one post to address all of the issues raised in the hearing, it will take an hour to read. While this hearing was supposed to focus on how to make OSHA “more effective and collaborative,” it consisted mostly of a vigorous, but generally inaccurate attack on OSHA during the Obama administration, alleging that the agency had essentially dropped compliance assistance in favor of all enforcement and all standards, all the time. This never happened as a glance at the budget over the last 10 years would show. The only year that the Compliance Assistance budget declined significantly during the Obama administration was in 2013 — the sequestration year when the entire federal budget was cut. And the enforcement budget never benefited from robbing the compliance assistance budget. In fact, the enforcement budget was never increased at all after 2010. In any case, with a Republican Congress in control, it’s Congress, not OSHA that determines the budget and sends it to the President for his signature. 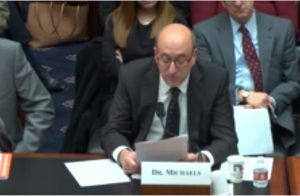 To summarize the testimony briefly, Hill, representing the Home Builders and speaking for the construction industry in general, described all of the compliance assistance activities OSHA should be doing to increase its collaboration with employers. Mostly good ideas; in fact, OSHA is already doing most of them. and was doing them throughout the last administration. Gerstenberger’s mission was to get OSHA to issue a standard covering tree care worker or arborists and he provided such a robust argument in favor of an OSHA Tree Care (or Arborist) standard — and, by extension for standards overall — that the Republicans would have been justified in declaring him to be a hostile witness. To make matters worse for the Republicans, Gerstenberger even give a ringing and unsolicited endorsement of the Susan Harwood Grant Program which seems to have left the Republican members flummoxed. We have been the thankful recipient of many Harwood grants in the past and used that money to produce a lot of effective training and convert a lot of folks in the industry open eyes and change attitudes of folks in the industry. We’d love the opportunity for that to continue. To do meaningful training for those in our industry. The Trump administration request in the FY 2018 and FY 2019 budgets to eliminate the Harwood program, and the House agreed. Happily the Senate voted to maintain the program for FY 2018. I will save most of my response to the Chamber’s testimony for another post where I can more fully discuss their issues under the Obama administration with OSHA enforcement, competence of OSHA inspectors, the need for OSHA standards, the basis for OSHA standards, OSHA’s use of press releases, OSHA’s use of the General Duty Clause, OSHA’s treatment of VPP, and a number of other smaller issues. Now I’ve never known anyone in OSHA — in any written statement, press interview, press release, hearing testimony or overheard conversation — state that OSHA’s focus should be on “catching as many bad employers as possible,” rather than keeping employees safe. Catching “bad” employers — e.g. employers who are subjecting their employees to unsafe working conditions — especially when they know better, or should know better — is not the end itself, but a means to an end; that end being keeping workers safe. The OSHAct established standard setting and enforcement as the twin foundations of OSHA. These two tools are to be supplemented by compliance assistance, outreach, and other activities. And there is compelling evidence that this formula works — that both strong standards and OSHA inspections are effective in preventing work injuries. The regulatory “tsunami’ could more accurately have been called a regulatory ripple. Now we used to hear the “tsunami” reference now and again when we were at OSHA. And it never failed to crack the room up. Because the regulatory “tsunami’ that Hill is referring to could more accurately have been called a regulatory ripple. One our biggest frustrations leading OSHA through eight years of the Obama administration was how difficult, resource-intensive and time-consuming it was to issue any new standards. The Government Accounting Office estimated that it took OSHA an average of 7 years to issue a new standard, but it took almost 20 years for the silica standard to be issued (more than 40 years after NIOSH recommended revision.) The fact is — and we were not proud of this — the Obama administration issued only eight major rules during its eight years, fewer than any previous administration with the exception of the George W. Bush administration. That’s fewer than Reagan, and fewer than Carter or Bush I, even though they only had one four-year term each. And one more thing. Only three of the major standards issued during the Obama administration directly affected the construction industry: Cranes and Derricks, Confined Spaces in Construction and Silica, and none of them had a significant effect on the home building industry. The Cranes and Derricks was a result of negotiated rulemaking that presumably left all parties happy. A very, very tiny tsunami. The closest the hearing came to real fireworks was when Donald Norcross (D-NJ), apparently got fed up with the Republican witnesses’ complaints that compliance with safety standards was so complicated and difficult, especially for small businesses. In summary, it is a false choice to say that OSHA must choose between strong enforcement and robust compliance assistance. OSHA must do both and during the Obama Administration, OSHA did both. Substituting voluntary programs for life-saving standards and a strong enforcement program would be a dereliction of duty and lead to more workers being hurt. I will leave it here for now. I’ll have several more things to say about issues raised at the hearing, so stay tuned. Part 2: Does the Rise in 2016 Workplace Fatalities Mean that OSHA Failed? Jordan, the link seems to be missing in your post to the hearing video feed. Thank you for this great coverage of the hearing! It doesn’t work on the email version. Click on the title of the email and go to the actual web page. You should be able to view the video from there.